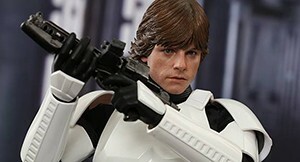 Hot Toys has revealed their next Toy Fair/Convention exclusive for the Star Wars Sixth Scale line: Luke Skywalker in Stormtrooper Disguise — Watch for an official preorder soon from Sideshow Collectibles. 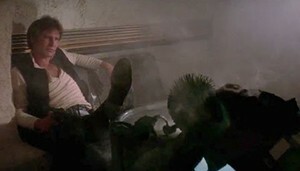 UPDATE Rumor Debunked: Han Shoots First, Again? There is a rumor circulating that there is a major change/correction in the release of Star Wars: The Digital Movie Collection, and if true, will right a terrible wrong. Word is that A New Hope as been revised once again to show that Han shot first in the infamous confrontation with Greedo. There is no visual proof of this yet or word of any other tinkering going on with any other scenes in any of the other films. I guess we’ll know tomorrow. Update: According to Dark Horizons, the rumor is false. Star Wars: A New Hope was the first mainstream movie to be dubbed into the Navajo language, and fans at Celebration can see a behind-the-scenes documentary on how that came to be, created especially for the event. Following the never-before-seen documentary footage, and a Q&A session with key players from the Navajo Nation and the film industry, Star Wars: A New Hope will be screened in the Navajo dub – a treat for Star Wars movie fans, and fans of languages, and of course for anyone who speaks Navajo! For more info head to the Star Wars Celebration website.